This Minneapolis hotel lies across the street from Orchestra Hall. 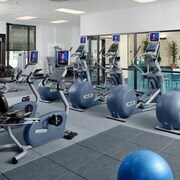 An indoor pool, and fitness center serve relaxation needs. The 24-hour business center, meeting rooms, and 77,000-sq-ft (7,150-sq-meters) of functional space cater to event needs. A technology help desk and support staff are also available. 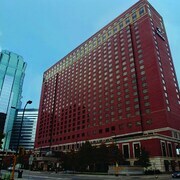 The Hilton Minneapolis has WiFi available throughout public spaces, including the lobby, restaurant, lounge, pool area, and fitness center. Guests may check out electronically through in-room TVs or telephones, and the lobby desk offers as many as 9 stations for busy times. The city-owned garage beneath the hotel offers 1,000 parking spaces (surcharge). This Hilton hotel provides a business center with free WiFi and 77,000 square feet (7,150 square meters) of function space, including a ballroom. An indoor pool and 24-hour fitness center are on site. All rooms include Hilton Serenity Beds, 50-inch HDTVs, and iPod docking stations. Ten 01 Social - This restaurant offers a comfortable yet distinctly metropolitan setting. 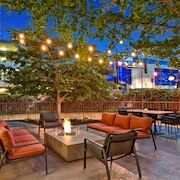 The menu showcases Chef Julian Grainger’s eclectic palate, and a variety of regional and international items to satisfy anyone's palate and preferences.Breakfast, lunch, dinner, nightly happy hour, cocktails, craft beers, late-night dining, and semi-private dining is available.